with the 11 for ’11 B.Y.E. eBook! Want to improve your fitness? Want to harness your mental strength? Want to make healthier food choices? Want to increase your motivation? Want to enhance your LIFE? 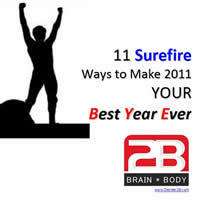 This eBook is about your 2011 B.Y.E. – or making it YOUR Best Year Ever. It will walk you through, step by simple step, how to get from where you are to where you want 2B. It’s the secret to your success in 2011.
must have. Click here for a sample chapter from the eBook. Currently On Sale for $11.11.